Dromore Castle is a very distinctive building sitting high on a hill overlooking two lakes in Co. Limerick, designed in the Gothic revival style by Edward William Godwin and built for the Earl of Limerick in the early 1870’s. Never a success as a house, it was abandoned by the Pery family during World War 1 and finally sold in 1939. Construction started in 1868 and completed in 1874. 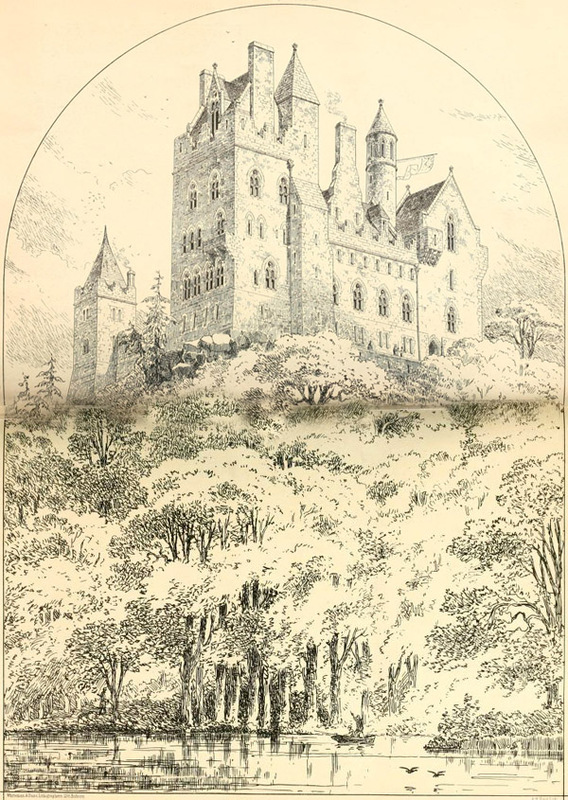 Godwin had an infinite capacity for detailing, and before he started any work on the drawings for the building, he visited and measured innumerable castles in Ireland. In this way he analysed the construction of roofs and porches, observed the joining of stonework. It consists of a three storey block, side tower and a round tower to the rear. The gateway leading to the entrance and thence to the Courtyard was a striking feature and rather symptomatic of the problems the castle would have. True to Godwin’s research, the gateway to the court was built to suit medieval forms of transport – and not the modern carriages of the day. When the castle was finished the profusion of turrets and chimneys and gables, crowned by a pointed turret was reminiscent of castles constructed in Bavaria and along the Rhine. 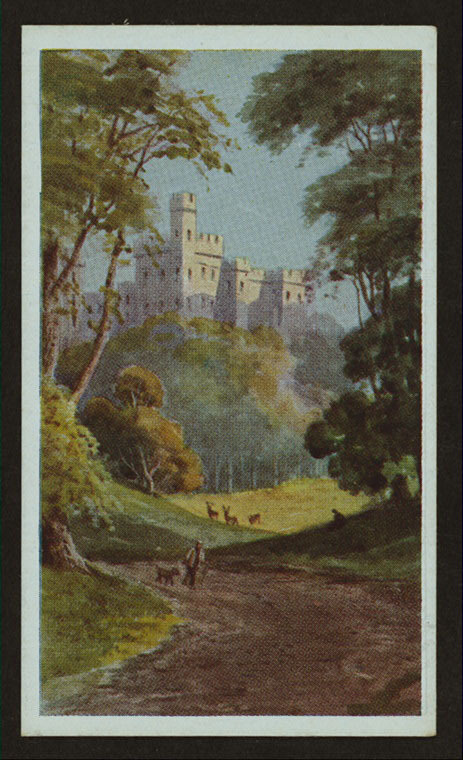 Godwin was delighted with the effect saying that “he had seen it by moonlight, seen it from the road at a distance from every angle, and the silhouette was about as charming a thing as ever he saw in his life”. 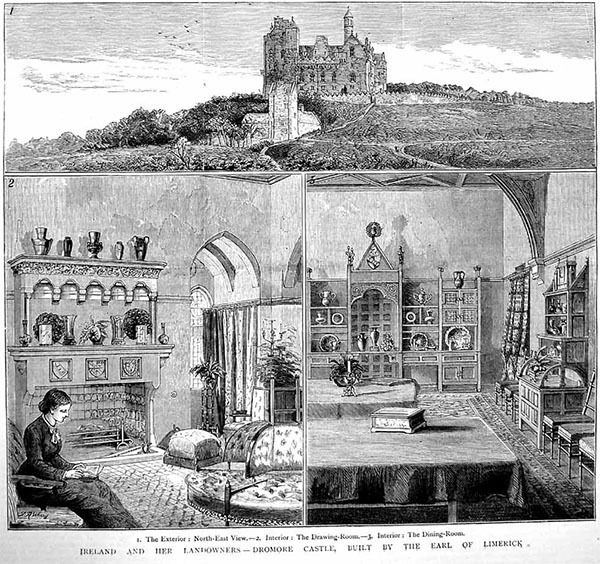 Godwin gave as much attention to the interior of the castle as to the exterior. The walls of the principal apartments were decorated by M. Marks, A.R.A. with figures in outline, filled in with plain, unshaded colours. Over the mantelpiece, a peacock provided the theme of decoration in anticipation of things to come. 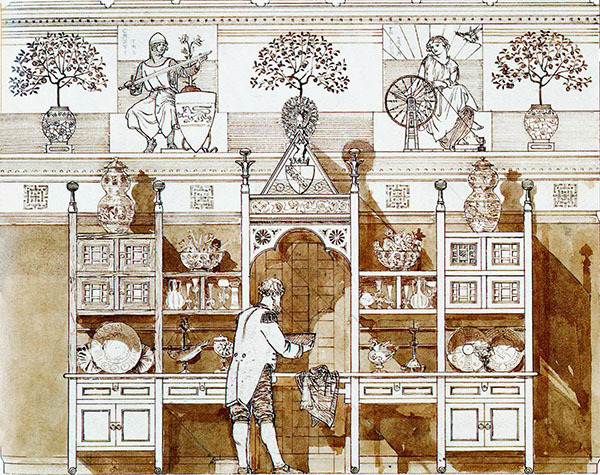 And when the decorations were finished Godwin designed all the furniture and fittings. Ultimately the building was to fall foul of the Irish climate and suffered badly from damp, which ruined much of the internal decoration. House interior dismantled circa 1954 to avoid rates being applied to it; shell remains.